The trees and bulrushes in the foreground and background grew on the banks of the Jordan River. This was the baptismal site of Jesus and many who came to John seeking the Kingdom of God. The winged seraphim on either side speak of the holiness of God. In his vision of God in the temple, Isaiah heard them proclaim God’s holiness as they covered their faces in reverence. 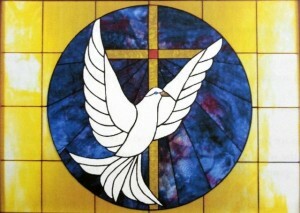 The presence of the Trinity is seen in the brilliant colors of the contemporary stained glass. The Father, whose voice was heard saying “This is my Beloved Son,” is depicted by the rays of light from heaven. Likewise, the Holy Spirit descended like a dove on Jesus at this baptism. The Baptistery window was given by one of the families in the church. 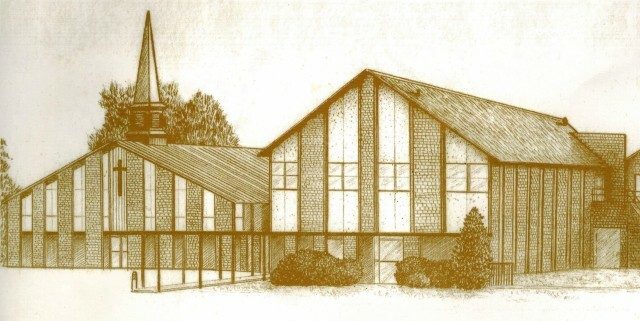 It was designed at Jinger’s Stained Glass Originals. The bold symbols of our Christian faith are seen in the Virgil Patton Memorial Window. The sphere represents our earth with vague images of continents, clouds, mountains, and oceans as seen from outer space. Overshadowing the earth is the cross, as John Bowring said “towering o’re the wrecks of time.” The red center of the cross represents the Blood of the Lamb that was shed for our sins. The Father, Son, and the Holy Spirit are all depicted in this memorial window — The Father as Creator of the earth and all the heavenly bodies; the Son as the Redeemer through his death on the cross and the Holy Spirit who is symbolized by the dove. Virgil and Willie Patton united with the Patton Chapel Baptist Church (now First Baptist Church of Hoover) on May 11, 1960. Virgil and Willie were here every time the doors were opened. He was a “handy man” and we still use tools from the shop now named “Virgil’s Work Shop.” He was a faithful deacon of the church for years. He served as a greeter and an user for years until his health failed him. He died in March 2001 and was buried in the local cemetery that bears his family name, Patton Chapel Cemetery. 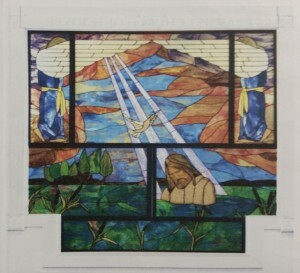 The Virgil Patton Memorial window, designed and built by Jinger’s Stained Glass Originals, is dedicated to the memory of Virgil Leon Patton.